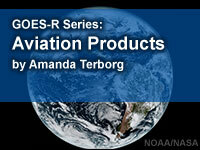 In this webinar recording, Amanda Terborg (with input from Dr. Chad Gravelle), will demonstrate the capabilities of GOES-R/16 in analyzing hazards affecting the aviation industry. The talk focuses specifically on four hazards (but there are others): 1) fog and low stratus, 2) in-flight turbulence, 3) dust, and 4) volcanic ash. Through the use of GOES-R/16 spectral bands, band differences, and RGB composites, satellite data users can detect the development and evolution of aviation threats better than with any previous geostationary satellites. This is a recorded webinar presented by an instructor at her home institution. Audio variations may exist. Interesting and informative, but felt slightly rushed. The questions are worded in a way that makes it difficult to grasp the learning point. When referring to maps she only uses the geographical places (states and cities) as a guide to what she is referring to, therefore if you are not familiar with a U.S.A map it is very hard to follow. Overall the maps and animations are interesting and useful however it is hard to fully grasp the learning points from each because the presenter does not have a clear flow when speaking. I had to go over it a couple times, enjoyed it. Describe the percentage of aviation delays caused by weather. Describe and give an example of a GOES-R/16 spectral band or "band difference" product used in a specific aviation application. Describe and give an example of a GOES-R/16 RGB composite used in an aviation application. Describe at least four types of aviation hazards, other than convective storms, that are better detected by GOES-R/16 than by previous geostationary satellites.